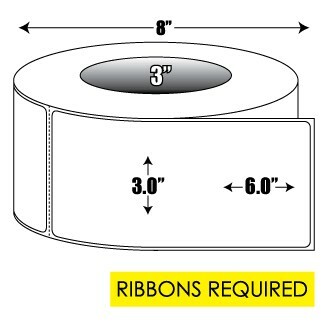 Click here to go to the Thermal Transfer Ribbons category. This product is suitable for use in a wide variety of thermal transfer label printers, including (but not limited to) Zebra, Sato, Datamax and Intermec. BLANCO’s Thermal Transfer labels have a smooth coated facestock which provides premium barcode printing. Smudge resistance has been optimized for a coated paper, but caution is recommended with contact scanners. Adhesive: general purpose permanent adhesive designed for excellent adhesion to corrugated cardboard and superior adhesion to plastics. This product is suitable for use in a wide variety of thermal transfer label printers, including (but not limited to) Zebra, Sato, Datamax, Fargo and Intermec. These Thermal Transfer Labels are ideal for printing variable data such as Barcodes, Shipping Labels, Carton Content Labels and Product ID Labels. BLANCO also manufactures a 3 in. x 6 in. thermal transfer label with a 1 inch core (see related items).